A long road to rehabilitation: METHADONE treatment for drug users in Cambodia marked its first anniversary this month, although key administrators say the pilot programme remains too limited in scope. Four years of advocacy from organisations such as UNAIDS and World Health Organisation led to the unveiling of Cambodia’s first methadone maintenance therapy (MMT) programme last year on July 1. The MMT programme represents a progressive health initiative for Cambodia, offering an alternative to drug detention centres where, according to a 2010 report by Human Rights Watch, people say they have been subjected to arbitrary detention and vicious beatings. Overseen by the Ministry of Health, oral methadone treatment is offered on a voluntary basis to injecting drug users who have formed a dependency on heroin. The programme is part of an overall strategy to reduce the spread of HIV in the Kingdom, focusing on injection users who are considered a “high risk” group for contracting HIV and hepatitis. “You have an elevated chance of contracting HIV if you share a syringe that is contaminated with the virus,” says Graham Shaw, an advisor on drug issues for the WHO, which provides technical assistance for the MMT program. 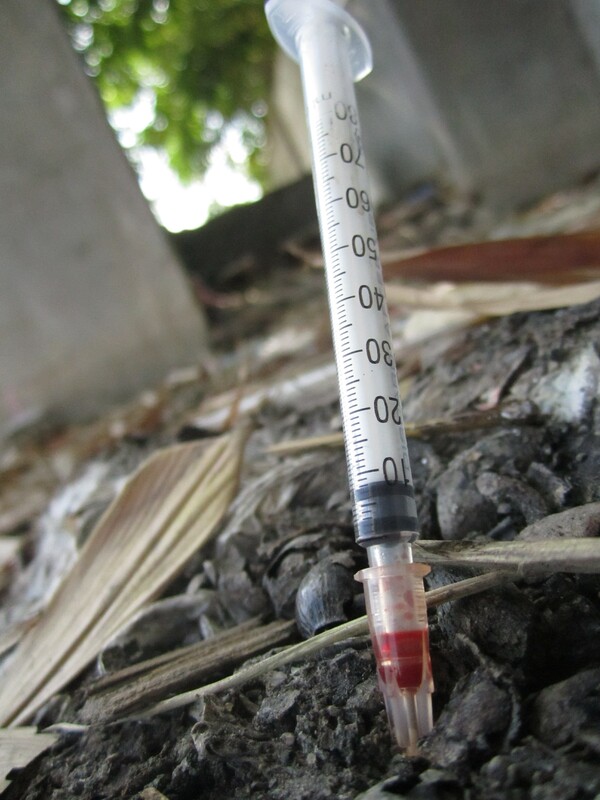 Shaw estimates that of between 1,000 to 3,000 injecting drugs users in Cambodia, nearly 80 percent of whom have hepatitis B or C. Users injecting drugs are a minority in the Kingdom, explains Shaw, and are outnumbered “ten to one” by people who inhale drugs such as yama and methamphetamines. The majority of injecting users live in the capital city and Cambodia’s first and only methadone clinic is situated in the grounds of the Khmer-Soviet Friendship Hospital in Phnom Penh. The programme is designed to stabilise individuals who have formed a dependency on opioids – drugs derived from the opium poppy such as heroin – through the provision of counseling services and a daily oral dose of methadone, a synthetic narcotic that works as a chemical substitute to ease withdrawal symptoms. But key administrators have identified a number of short-falls with the pilot programme over the past 12 months that have yet to be remedied. These include a lack of external support services for most patients, the absence of guaranteed funding for what is inherently long-term treatment, as well as limited experience among clinical staff for weaning patients off methadone if they wish to terminate treatment. “This is the first [methadone] clinic and we don’t have a lot of experience with this. With time we are building confidence,” said Chhit Sophal, director of the clinic. He says that more than 110 patients have enrolled with the MMT program so far. Men and women between the ages of 18 and 57 wait in line at the clinic each morning, seven days a week, some holding a toddler in their arms. “[Methadone] is a form of heroin,” explains Shaw, illustrating a controversial aspect of the treatment. Patients, in essence, remain addicts who are switched from one narcotic to another. Treatment is long-term, taking months to years as tailored doses of methadone ease heroin withdrawal to a point where an individual’s cravings have dissipated. Some patients are later weaned off methadone although some are known to remain on treatment for 20 years or more. Four organisations select candidates for the programme, including Korsang, a harm reduction organisation, in addition to the Khmer HIV/AIDS NGO alliance, Mith Samlanh and Friends International. Shaw says these organisations were chosen by officials due to existing relationships their staff have formed with injection users through support services. One example of success, highlighted by Shaw, is Korsang’s effort to improve patient accessibility by shuttling patients to the clinic each day using tuk tuks. Other services, however, are failing to reach many patients and illustrate a critical limitation of the MMT programme in Cambodia. “When they come back from the clinic, some [patients] go out and find money, many of them lay here [at Korsang] and sleep. There’s nothing to keep them busy,” says Sao Suy, supervisor assistant for Korsang, which has referred nearly two-thirds of clinic patients so far. “So now they are on methadone and it makes them stable. But what’s next?” he asks. Listing a number of services that are available in other countries for methadone patients, David Harding, technical drug advisor for Friends International, says that the MMT programme is a step in the right direction but more work must be done. “Access to employment, reintegration with family networks if possible, assuming that [patients] haven’t done too much damage, [as well as] self-help groups. Unless you can bring some of these things together it can be very difficult for people to maintain themselves beyond just taking heroin,” he says, adding that Friends International offers vocational training to MMT patients but their programmes are mandated to target people aged 24 and under. Clinic records show that almost 90 per cent of the MMT patients are over the age of 24 and the average is aged 30. Administrators also say that there is no official agreement between law enforcement and the Ministry of Health regarding methadone patients who have been detained or arrested. Studies show that methadone withdrawal can be worse than heroin if a patient is suddenly cut-off and denied drug access. These situations, although infrequent, reveal a vulnerability among patients who face significant repercussions if they fail to receive a dose within two or three days. Cambodia has yet to offer treatment options commonly found overseas. For example, some countries permit pharmacies to administer methadone or provide take-away options for patients, allowing individuals to sustain themselves for a few days away from the clinic. Despite the problems, methadone remains an appealing treatment option largely because it is low-cost. About US$1 million was directed to the initial start-up, largely funded by AusAID, Australia’s overseas aid organisation, in addition to Family Health International, a public health and development organisation based in the US. Shaw says the annual budget is expected to be less than $100,000 over the next year, including salary supplements, ongoing training and methadone procurement from New Zealand that costs less than $100 a year for each patient. Financial uncertainty remains “one of the greatest concerns” of the programme, according to Shaw. Regardless, Chhit Sophal says he may expand methadone treatment to a maximum of 300 patients over the coming year despite having no knowledge of guaranteed funding beyond July 2012.